What's your life's dream? Are you doing what you love and having fun doing it? Your dream is your birthright and you deserve to live the life you've always wanted. Don't be content going through life as an opening act when you can be a rock star! Rock and Roll Guru Joe Heuer is a living example of living a dream. Living your dream, he says, is possible, if you apply all the rock-and-roll mojo you can muster to believing in it and incorporating love, passion, inspiration, imagination, creativity, and fun to the process of achieving it. 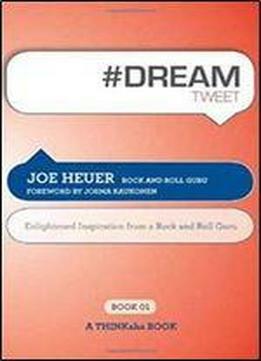 In his visionary book 'DREAMtweet Book01,' Heuer provides 140 rock-and-roll-infused, tweet-sized ideas that you can employ right now to begin living your dream. Based on his own life philosophies and the realization of his own dream as the Rock and Roll Guru, Heuer invites you to observe your own beliefs and consider whether they are moving you toward your dream. He encourages you to renew your passion, to bathe your dream in love and pursue it with intuition and abandon, to use your creativity to remove any challenges of attaining it, and to dance with pure joy to every beat of your own drum. 'DREAMtweet Book01' will inspire you to take action on your wildest dreams today! You will learn how to develop a vivid and compelling vision of your dream, while creating the foundation for pursuing it. You'll master the art of employing imagination to obliterate roadblocks as you invite a ton of fun into your exhilarating journey. Heuer inspires confidence and courage to live the life you've always wanted. Let this stimulating and compelling book be your guide as you turn your dreams into play. '#DREAMtweet Book01' is part of the THINKaha series whose 100-page books contain 140 well-thought-out quotes (tweets/ahas).